Cheap giant. 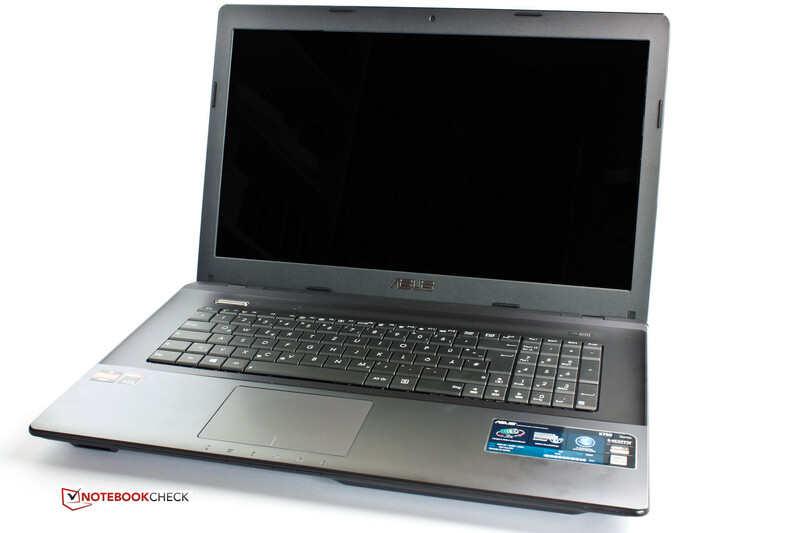 The Asus K75DE is a 17-inch multimedia contender equipped with an AMD-APU and CrossFire technology. Find out more about the device in the following review. 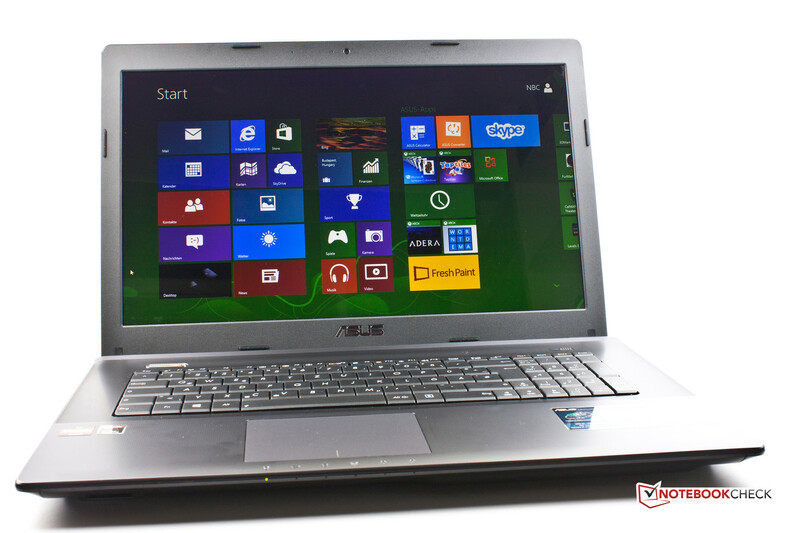 Asus presents a new 17.3-inch multimedia notebook in the form of the K75DE-TY068H. This category is already filled with multiple contenders, like the Samsung Series 3 355E7C-S05DE or the HP Pavilion g7-2051sg, which also use the AMD Trinity APUs. In addition to these two, we will also use the Sony Vaio SV-E1712F1EW, which runs on Intel hardware but has the same size and price class, for comparison. The K75DE series offers various configurations. Our test model has an AMD APU A8-4500M, which can be ranked as the medium performance option (out of all the available configurations). 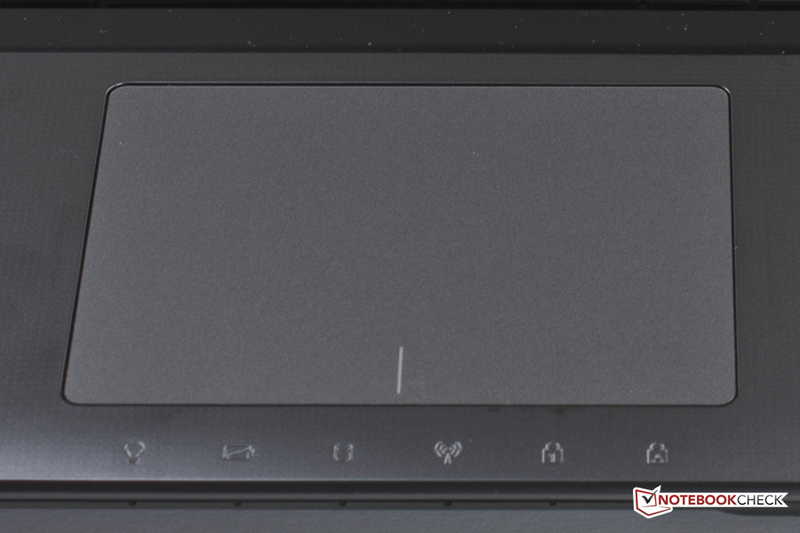 The test model is equipped with a DVD burner, but an upgrade to Blu-ray drive or writer is also possible. Our test model and its Intel-based sibling, the K75VJ, steal the spot of cheapest DTR for private users (Desktop Replacement). DTR models master everyday tasks and have sufficient power for media playback and gaming. 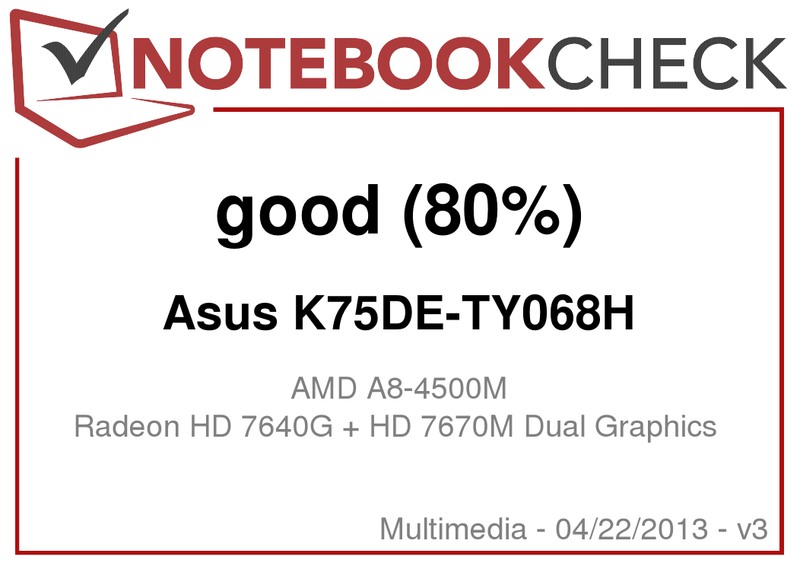 In the following review, we will investigate in detail what the Asus K75DE-TY068H has to offer. The notebook is made entirely of synthetic material and kept in black, which appears metallic due to its surface structure. 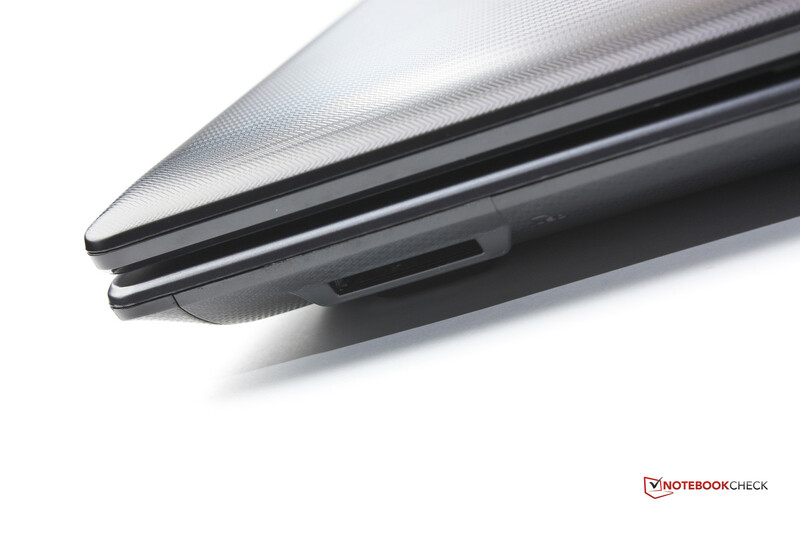 This grants the laptop a certain visual appeal and the material is comfortable to touch. The synthetic material is covered with the aforementioned structure and is susceptible to fingerprints and smudges, which are quite visible. The case and the display can be pushed inwards with little force and are prone to creaking. The display is especially sensitive and we recommend handling it near the middle. The two hinges are sturdy and hold the display well. Opening the notebook requires both hands. 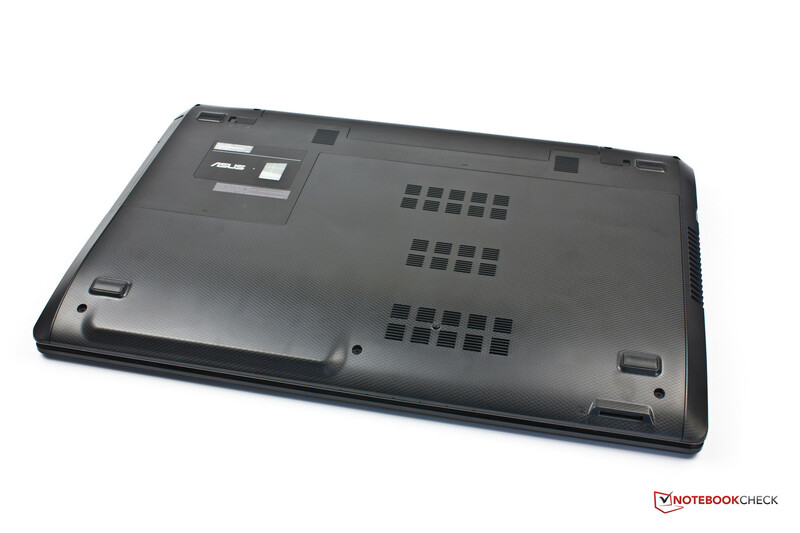 The four rubber feet ensure good grip for the notebook. The corners of the case are rounded and the chassis has no gaps in the material. The battery can be swapped out and is secured with two hooks. The laptop can run without battery. 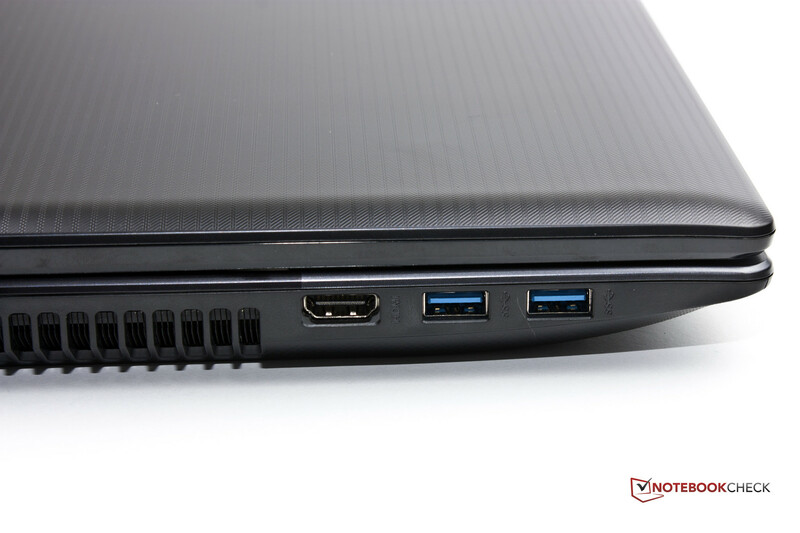 The connectivity of the Asus K75DE is acceptable and conforms to that of the competition. Only the Sony SV-E1712F1EW sticks out of the pack as it has one USB 3.0 port less (but makes up for it with an additional USB 2.0). The positioning is well-planned. 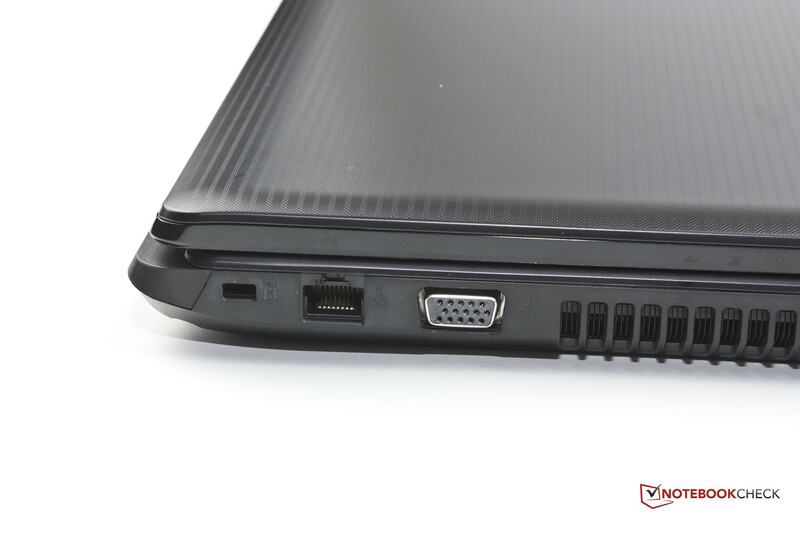 The ports are far enough from each other so that they do not block each other when in use. The SD card reader is worthy of mention. The cards stick out of it slightly which allows the user to easily remove them once done. Front: card reader (SD, SDHC, SDXC). Right side: headphone jack, microphone jack, 2x USB 2.0, DVD drive and power outlet. Left side: Kensington Lock, LAN, VGA, HDMI and 2x USB 3.0. The Asus K75DE-TY068H uses a RealTek Gigabit-LAN interface which works quite well. The wireless networking is achieved using a Qualcomm Atheros WLAN module (AR9485), which supports the 802.11 b/g/n standards, and has a max transfer rate of 150 MB/s. It operates on the 2.4 GHz frequency and has good range. The connection was stable even up to 10-12 meters from the WLAN router (Fritz!Box 6360) and could deliver a transfer speed of up to 16.5 Mbit/s. Bluetooth or WWAN are not to be found. The integrated VGA webcam has a resolution of 640x480 pixels and suffices for VoIP. The integrated microphone works well and the input is clear even 1.5 meters away from the notebook. Besides the 90 W power adapter, the notebook delivery includes three manuals for warranty, Windows 8 and a "Hardware" book. In addition to the various Asus programs and a few Windows 8 Apps, the test model also has test versions of McAfee Internet Security and Microsoft Office preinstalled. 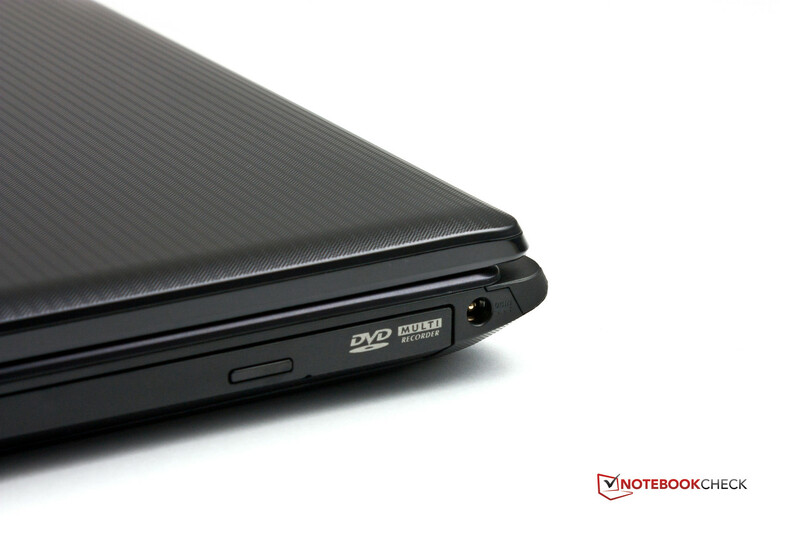 The ASUSDVD program on the laptop originates from Cyberlink and resembles PowerDVD 10. 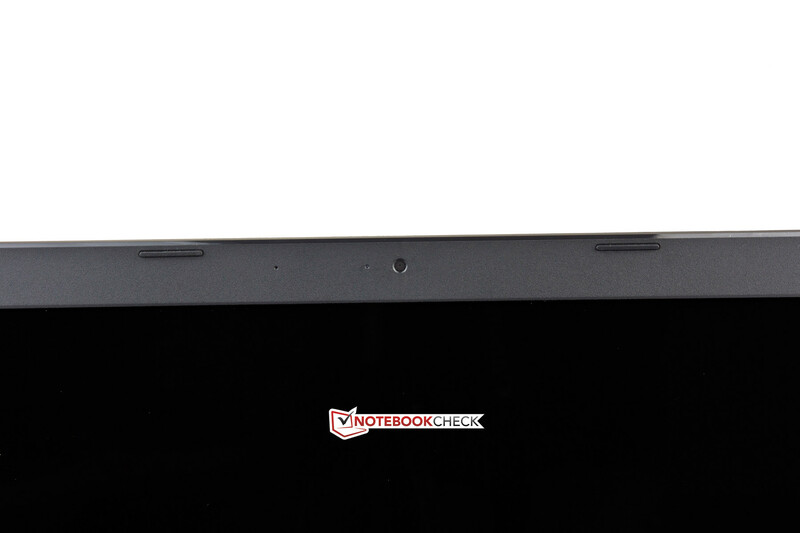 The bottom of the notebook includes a maintenance flap secured by three screws. 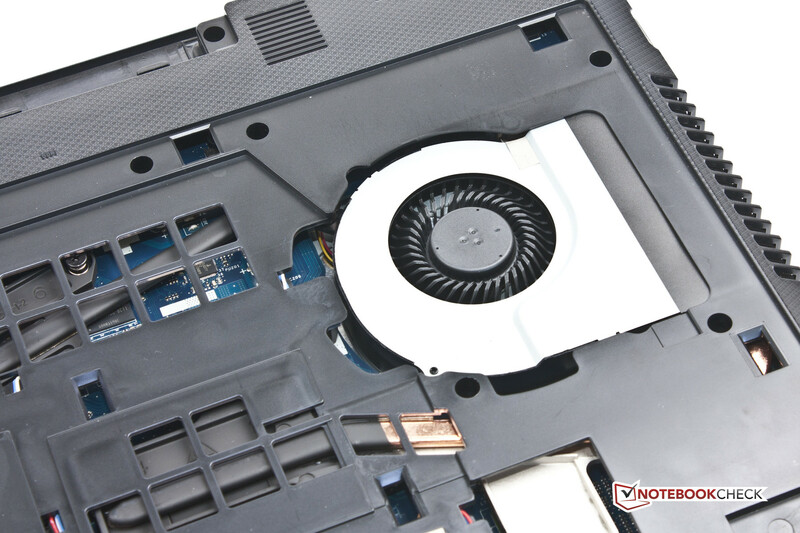 Once removed, the CPU cooler fan can be cleaned. The flap also grants access to the RAM slots (only one is occupied) and the WLAN module. 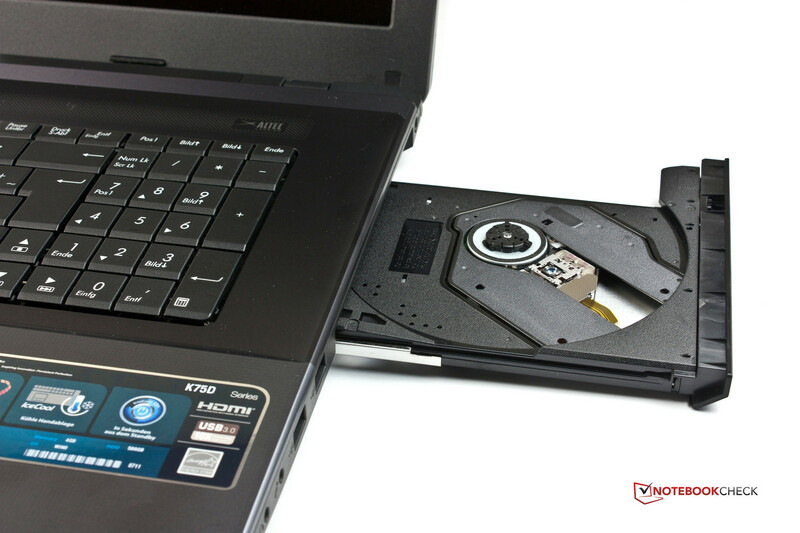 A free 2.5-inch slot offers space for an additional SATA hard drive. 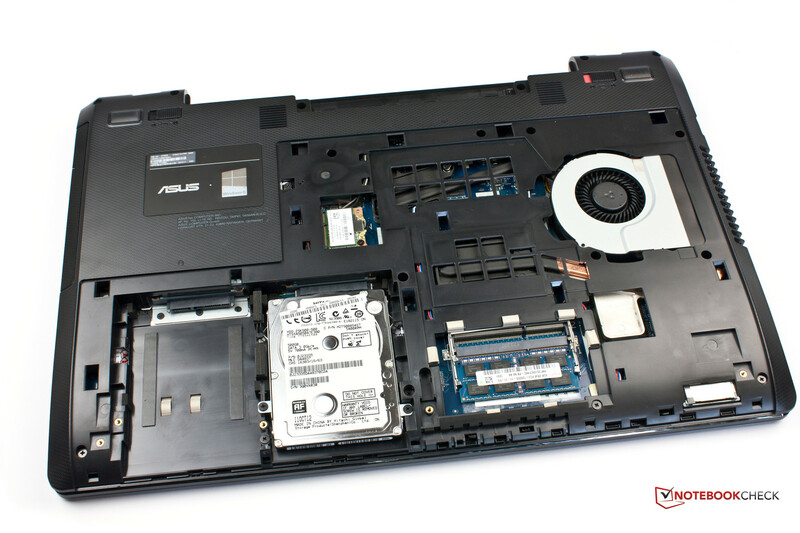 The Asus K75DE is easily accessible and offers upgrade possibilities. 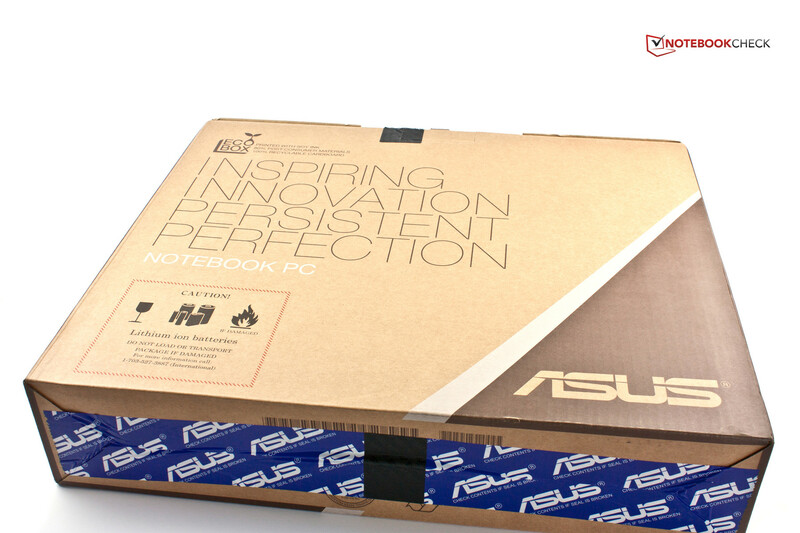 Asus grants 24 months warranty which can be extended for another year in the Asus Shop. This costs between 69 - 79 Euros (~$90 - $103), depending on whether the user chooses warranty for their country or international service. 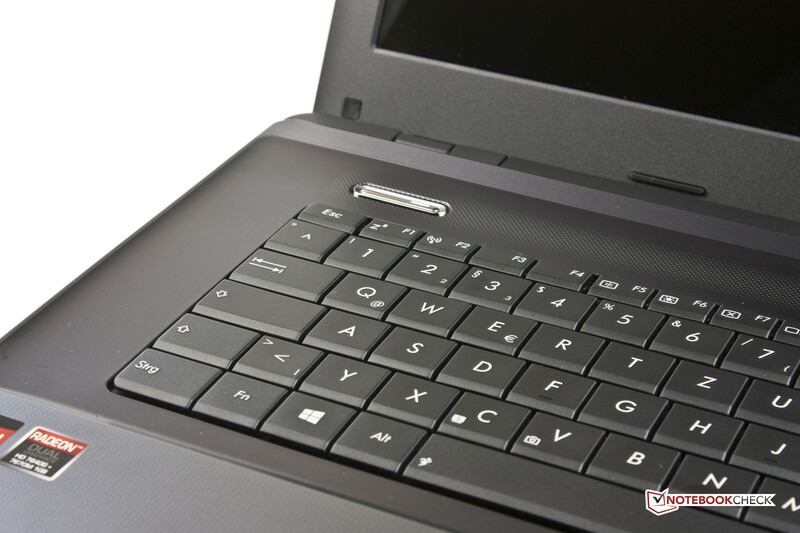 The QWERTY keys are 17x17 mm, flat and have a rough surface, which feels comfortable. The keys are quiet but the stroke distance could have been shorter. Also, the keyboard bends inwards slightly when the user presses hard. The function key (Fn) allows the user to access a few additional functions, but Asus has completely left out special functions. Status LEDs for the numeric pad and other activities are included on the case. 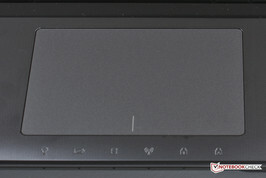 The touchpad of the K75DE measures 10.5 x 7.4 cm and is very well-dimensioned. The smooth surface has good sliding properties and is very precise. 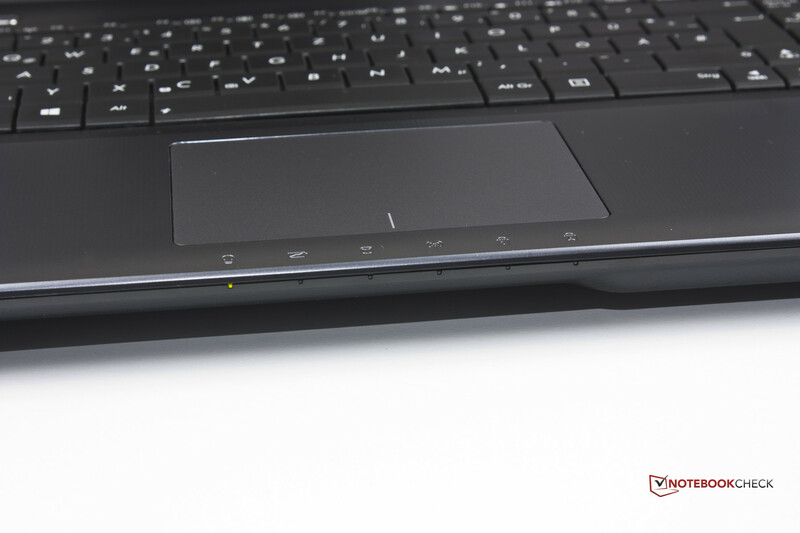 The bottom part of the touchpad includes two mouse keys which have good pressure points. The stroke distance is good and multi-touch gestures are supported. 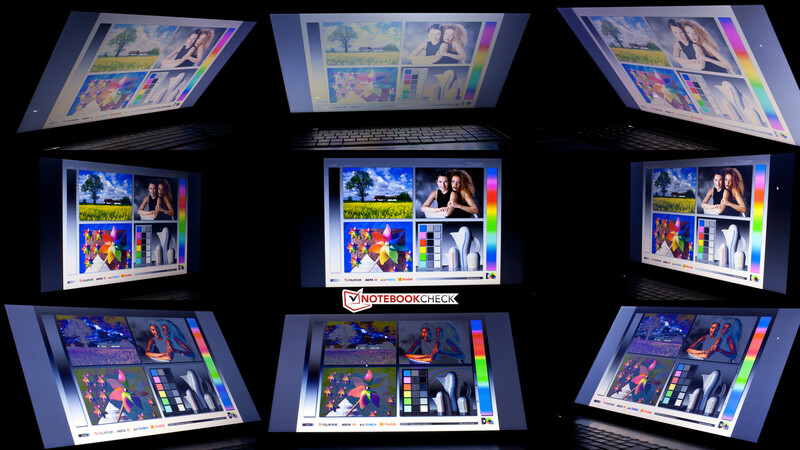 The glossy 17.3-inch HD+ display with LED backlight has a resolution of 1600x900 pixels. 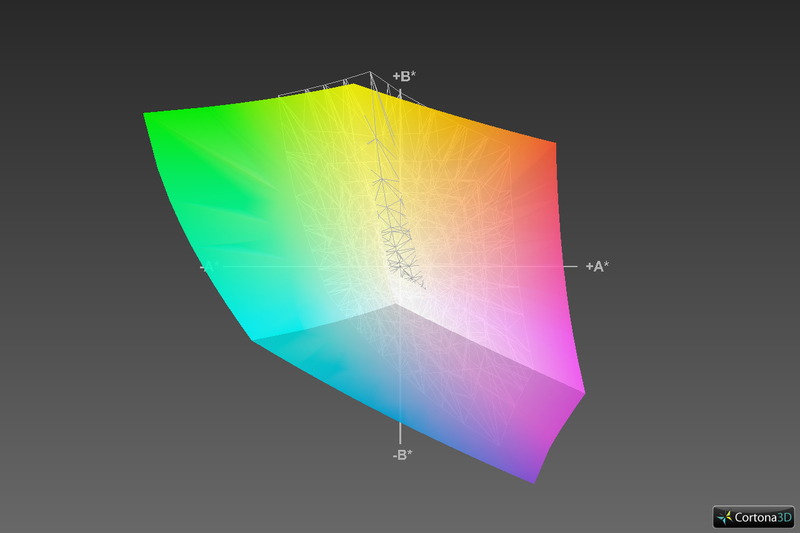 The low resolution (106 PPI) limits the work space available slightly, as can be seen when compared to an FHD panel. However, this resolution displays content sufficiently well and the 16:9 format is suited for movie playback. The average brightness of 223 cd/m² is slightly lower than that of the Samsung 355E7C-S05DE (244.7 cd/m²) and the Sony Vaio SV-E1712F1EW (244.1 cd/m²). The illumination is balanced and there are no bright spots. The black value of 0.92 cd/m² and contrast of 256:1 are not impressive, as both the Sony (0.92 cd/m²; 268:1) and the Samsung models (0.78 cd/m²; 314:1) offer (marginally) better values. 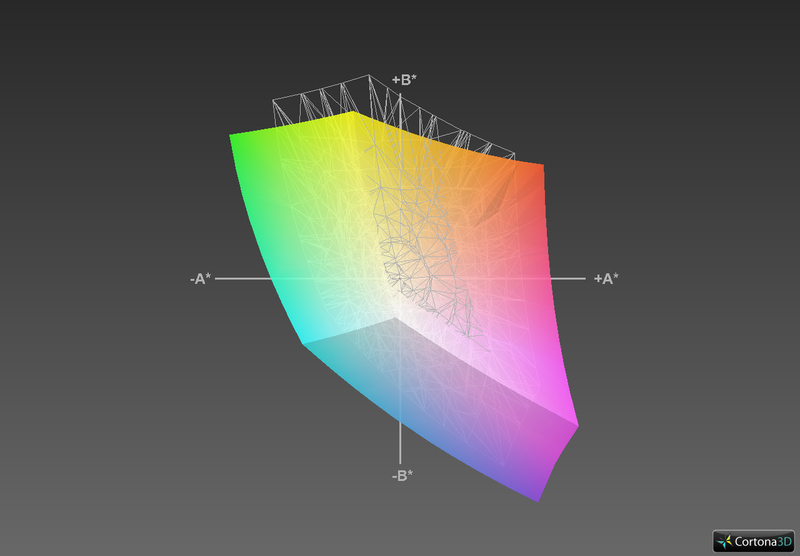 Photographers or other users, who want accurate color depiction, will not be happy with this panel as the color space coverage is too limited for professional use. The uncalibrated display shows a deviation of 12 strong levels from the accepted gray levels in the DeltaE 2000 index. The saturation is not good either. Magenta and cyan drift heavily to blue, which grants the screen a visible blue tint. In the color accuracy, white and cyan show clear weaknesses and the DeltaE here is far above 15. We recommend finding a shaded spot if you intend to bring the laptop outdoors. The reflective display and the low brightness make using it in direct sunlight difficult. The Samsung 355E7C with its matte display is better suited for that task. As is the standard in the industry, the viewing angles of the TN panel are not satisfying. The picture can drastically change with even small deviations in the vertical viewing angle. This makes the use of the device on the lap harder, but given its size, this would have been an inconvenient way to use the notebook anyway. The Sony and Samsung competition offer similar performances. 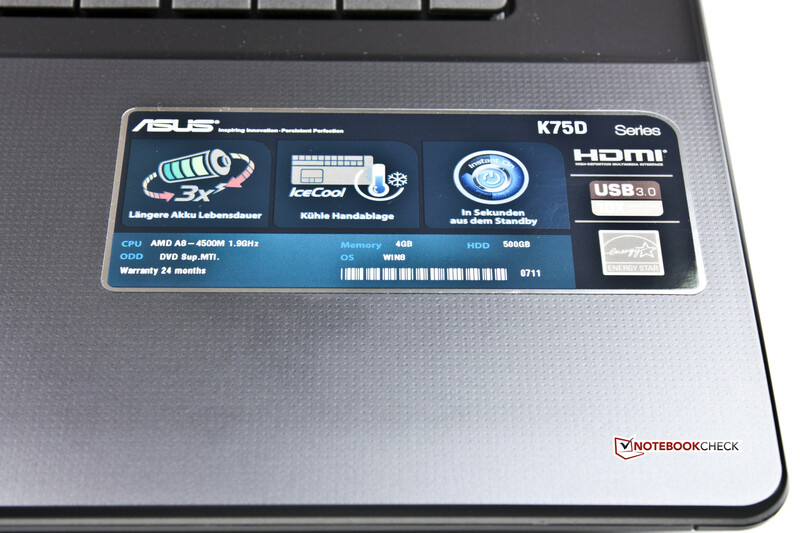 The Asus K75DE-TY068H uses an AMD A8-4500M APU, which is based on the AMD Trinity architecture. The platform is equipped with 4 GB of RAM and a 500 GB Hitachi hard drive - conventional hardware. 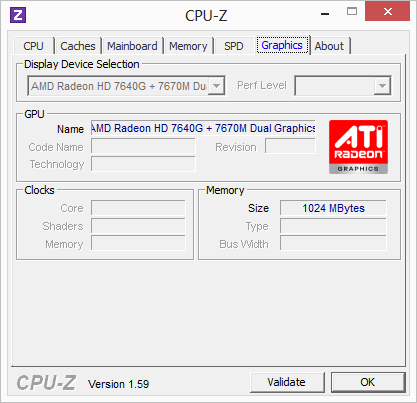 The IGP (Integrated Graphics Processor) of the model is a Radeon HD 7640G. 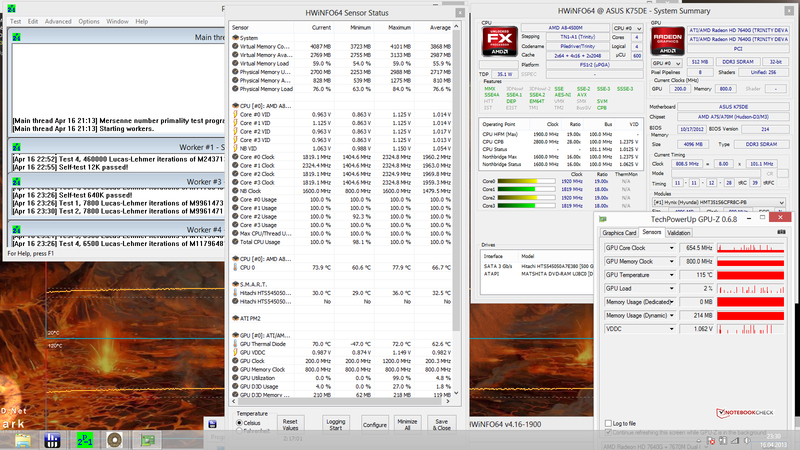 When more performance is required, a Radeon HD 7670M (CrossFire) kicks in. From the performance, it seems Asus is aiming for buyers who need a laptop powerful enough for everyday tasks and occasional gaming. 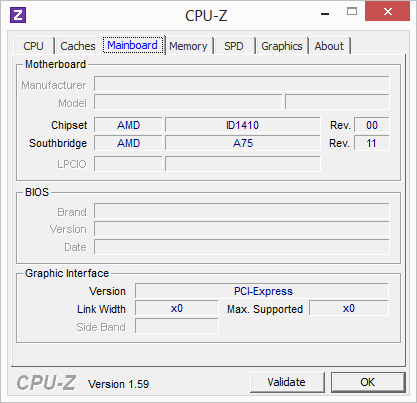 The Trinity APU chosen by Asus is a quad-core processor with a base clock speed of 1,900 MHz. This can be increased (using AMD Turbo Core) up to 2,800 MHz. 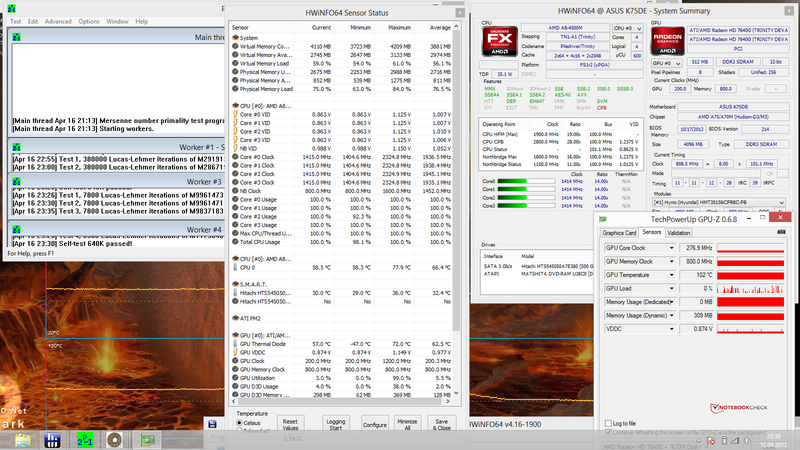 During the multi-core Cinebench R10 benchmark all cores worked at speeds between 1.9 - 2.3 GHz. The Turbo was never exhausted during the benchmark. On pure battery mode, the performance of each core was limited to 1,415 MHz and did not fluctuate. The single-core benchmark painted a similar picture. 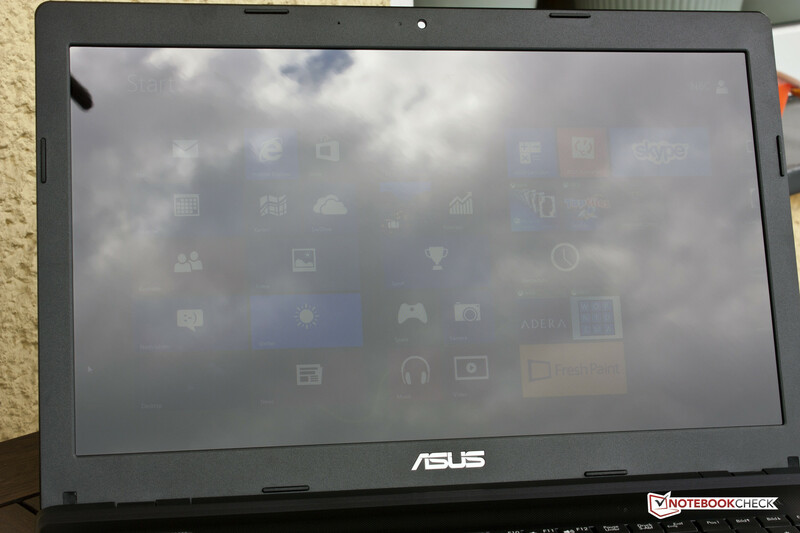 Despite the same hardware platform, the Asus K75DE is slightly more powerful than the Samsung 355E7C. However, it cannot compete with the performance of the dual-core CPU of the Sony Vaio (Pentium B980/HD 7650M). 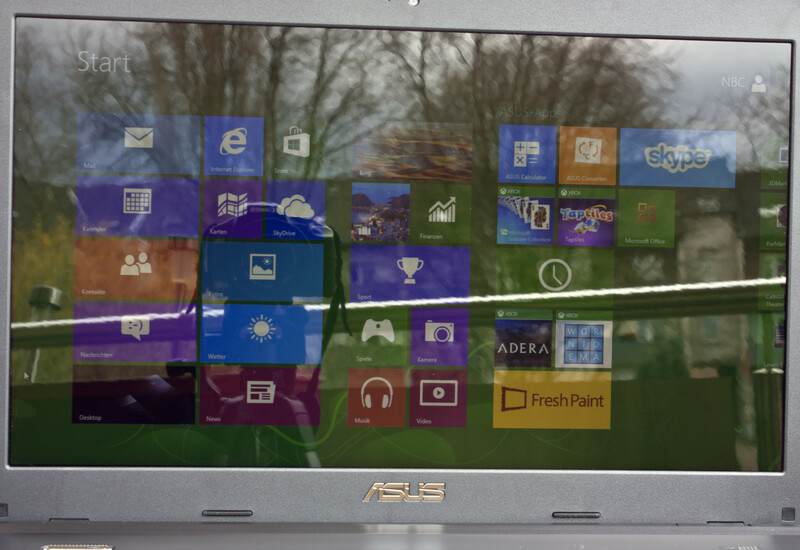 Windows 8 runs (almost) fluidly on the Asus K75DE-TY068H. While starting apps small delays are noticeable now and then. 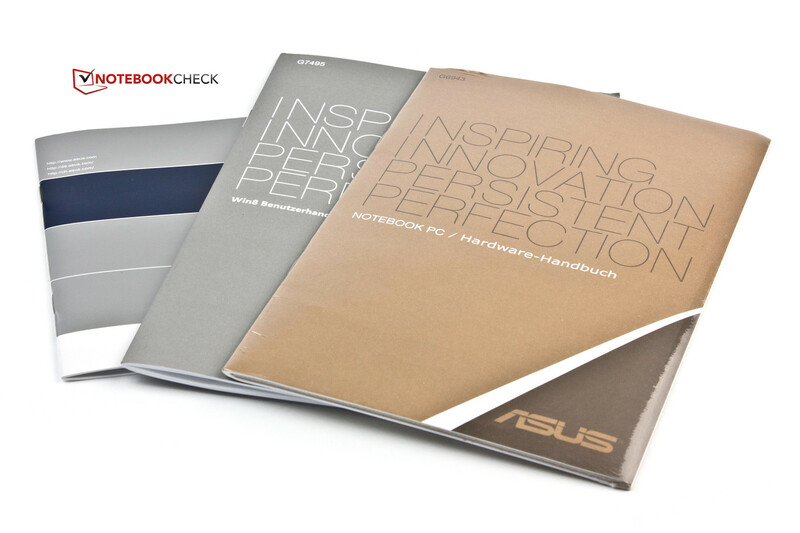 The PCMark 7 system benchmark offers almost identical results for all competitors. 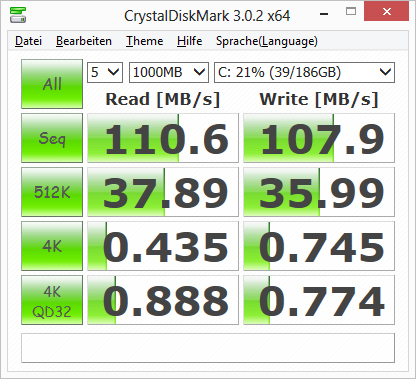 Only the Sony Vaio SV-E1712F1EW can beat the APU platforms by a small gap. 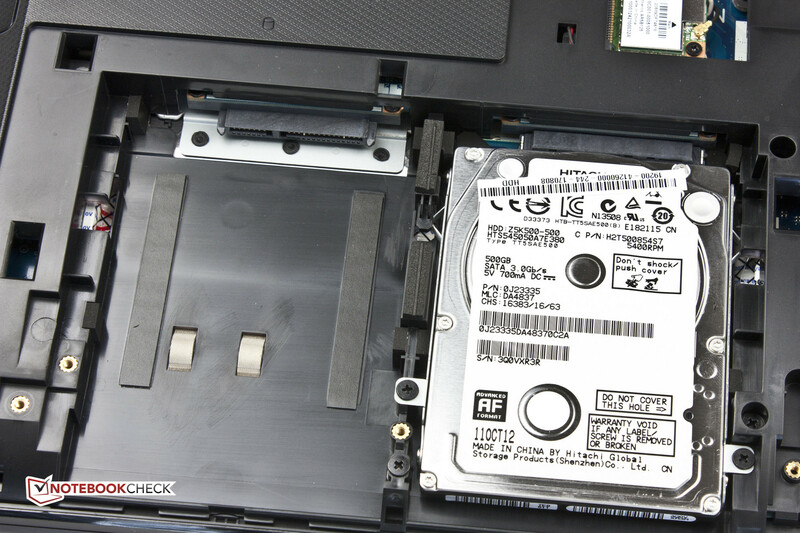 Adding an SSD would be a sensible decision as the model has a free HDD Slot. If the system partition is copied there, the overall performance will noticeably rise. The hard drive is a 500 GB drive from Hitachi (HTS545050A7E380) and it operates at 5,400 rpm. The low rotation speed means that the user should not expect fast access times. Still, 23 ms is far more than we expected. 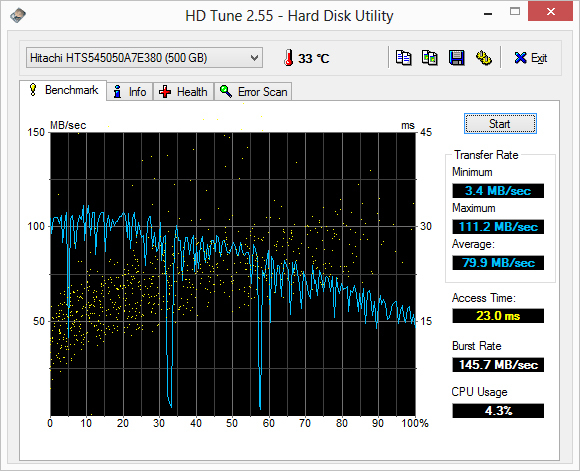 The transfer speeds we measured with HD Tune are also good. Overall, the hard drive offers average performance for its class. In our test model, we have a CrossFire AMD GPU system: the Radeon HD 7640G and a 7670M. This dual GPU system essentially allows the GPUs to alternate in processing images (asymmetrical). 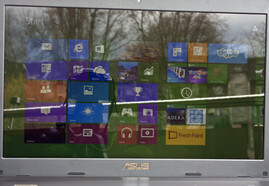 The AMD platform can showcase its strengths vs. the Sony Vaio (dedicated Radeon HD 7650M) in this section. The benchmark score in 3DMark 11 is a good 600 points higher than that of the competition. This places our Asus CrossFire team between the Nvidia GeForce GTX 560M and GeForce GT 640M (in terms of performance), but our test model could not perform as well in older 3DMark benchmarks. Next we will see what issues can crop up when the CrossFire system is used for gaming. The CrossFire system offers good results for many of the latest games. In fact, most of the new games can be run at medium or high resolutions fluidly, as long as the notebook is run with the power adapter connected. More demanding games, such as Crysis 3 or Hitman: Absolution, require dropping of graphic details for a fluid picture. This is probably due to the weak CPU, but may also be due to the throttling of the 7670M at load. 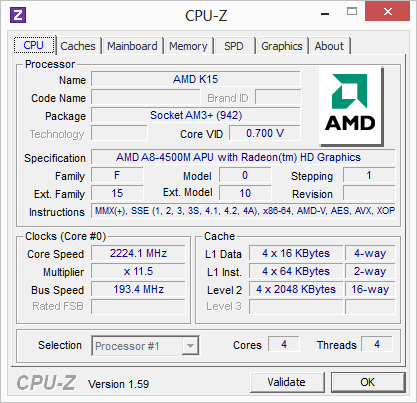 During our stress test, the clock speed dropped to 454 MHz, which is 146 MHz below the base speed. This indicates that the CrossFire solution is weaker in games than it is in the benchmarks. Our comparison test with Anno 2070 serves to prove our point. The Toshiba Satellite Pro L870-16P, which uses a dedicated Radeon HD 7670M and a Core i5 CPU, is far superior to our test model. This places our CrossFire system at the level of a GT 635M. Thanks to Anno 2070 we ascertained a better understanding of how the hardware operates on battery and while connected to a power socket. The game was run at the native resolution of 1600x900 pixels with low details. While connected to a power outlet, the model achieves a frame rate of 61 fps, but on battery, the performance drops to a maximum of 49 fps. This is due to the fact that both the CPU and GPU are throttled. The micro stutters typical to such a dual-graphics system were noticeable on our test model as well after 30 fps. On our Radeon HD 7640G + 7670M page, the reader will find various other benchmarks with new games using the CrossFire system. An overview of the latest games and their performance on mobile GPUs can be found here. 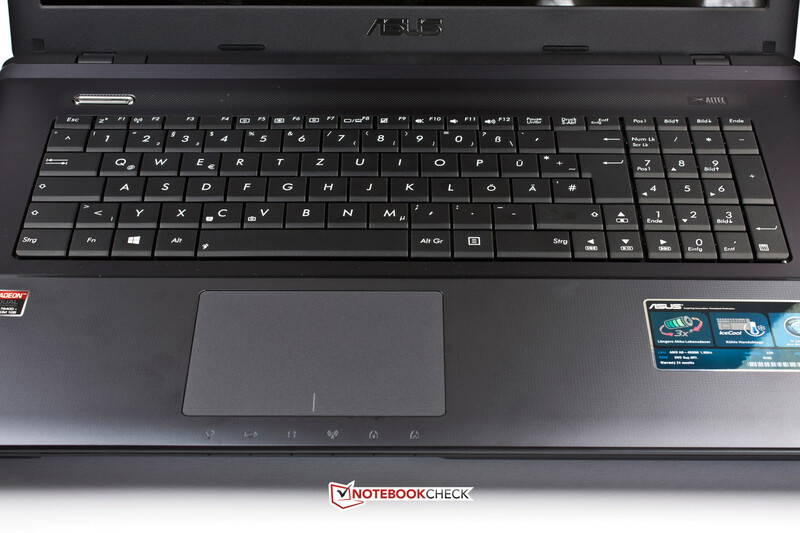 The Asus K75DE-TY068H is a relatively quiet notebook. While idle, it does not get louder than 30.8 dB(A) and the cooler fan remains off for the majority of the time. The hard drive is also quiet at 30.4 dB(A). 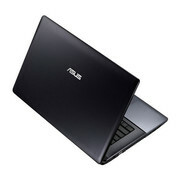 This makes Asus a better choice than the Samsung 355E7C, which has a higher noise emission. The DVD playback test paints a similar picture. At extreme load, the Samsung model performs better than the K75DE, as it never gets higher than 39 dB(A). The Asus notebook can reach peaks of up to 44.1 dB(A) in the stress test (Prime95 and FurMark). This is a maximum emission and will rarely occur in everyday use. While idle, the surface temperatures of our test model never rose above 33 °C. Sony shows us that it is possible to do better with its 17-inch model which never got hotter than 28 °C. At load (stress test), the competitors swap positions and the Asus K75DE stays 4.6 °C cooler. 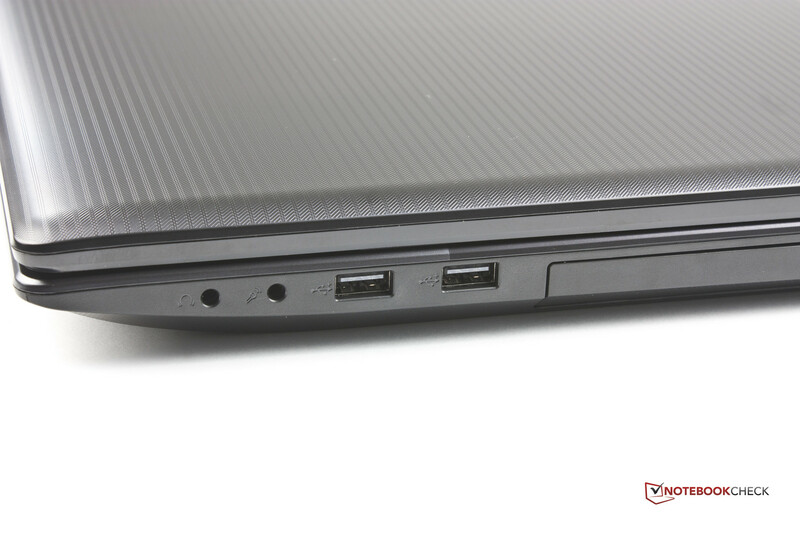 Asus boasts of their cool hand-rest regions and have dubbed their clever positioning of the hardware: "IceCool". The notebook can live up to the claim and the hand-rest regions never get warm (even at full load). During, the CPU stress test with Prime95, the CPU temperature never rises above the 66 °C mark. 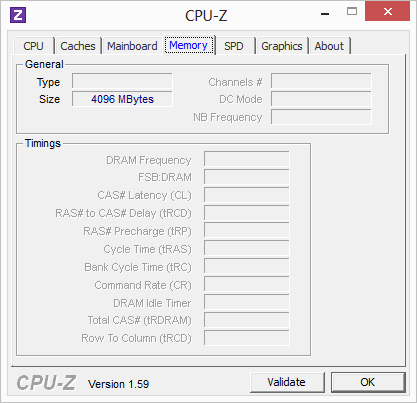 The clock speed fluctuates between 1.9 - 2.3 GHz at the start, and during long periods of high load, is known to drop momentarily to 1.4 GHz. This short-term throttling does not explain the poor benchmark results (in comparison to the Samsung 355E7C). The clock speed of the Samsung competitor drops to 900 MHz. In the combined stress test (Prime95 + FurMark), the CPU temperature rises to 78 °C. Right after the stress test, we ran the 3DMark 2006 benchmark, which recorded a lower score (-797 points) than in the "cold" state (before running the stress test). The throttling of the 7670M is responsible for this poor performance, as this chip falls short of its base clock speed of 600 MHz by about 146 MHz. If the laptop is on battery mode, all cores process at a constant 1,414 MHz. The GPUs present similar behavior. 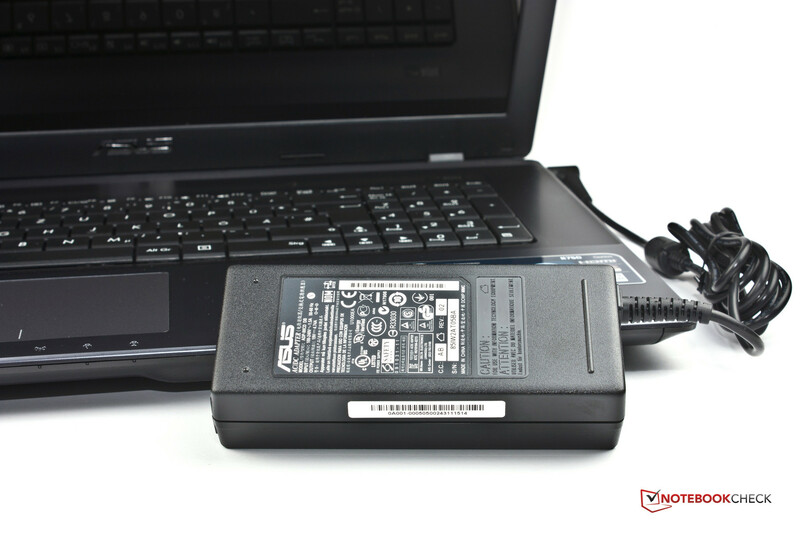 With the power adapter, they operate at 334 and 655 MHz, but once the laptop is running on battery, the speed drops to 277 MHz. (±) The average temperature for the upper side under maximal load is 32.9 °C / 91 F, compared to the average of 30.9 °C / 88 F for the devices in the class Multimedia. (±) The maximum temperature on the upper side is 40.3 °C / 105 F, compared to the average of 36.5 °C / 98 F, ranging from 21.1 to 71 °C for the class Multimedia. (-) The average temperature of the palmrest area of similar devices was 29.1 °C / 84.4 F (-2.3 °C / -4.1 F). 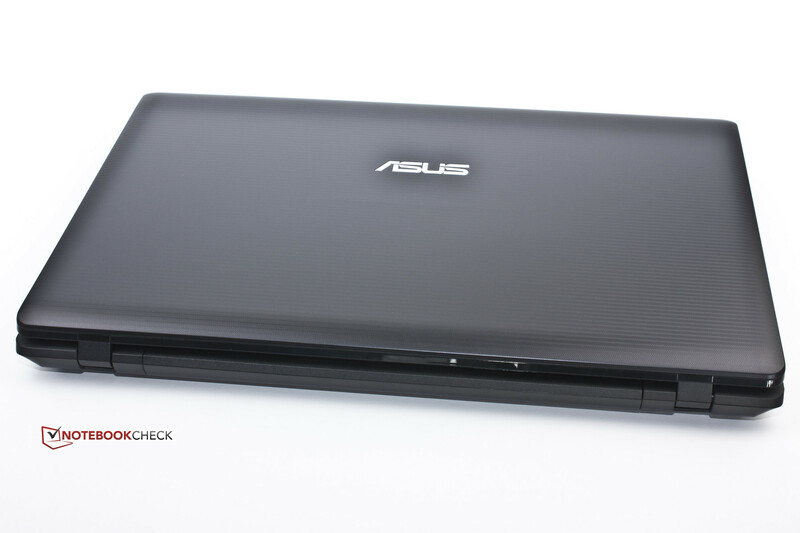 The SonicMaster technology touted by Asus does a decent job. Although the speakers are placed on the bottom, they offer good and clear sound output. Sadly the bass is very weak. Skype calls are clear, making this laptop a great choice for VoIP. 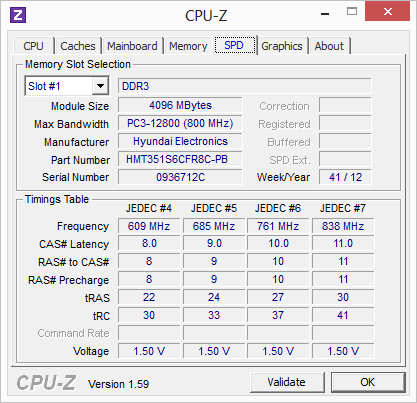 The Asus K75DE-TY068H requires maximum 18.4 W while idle, which places it slightly higher than the Samsung 355E7C (17.1 W) and the Sony SV-E1712F1EW (17.0 W). All in all, the power consumption is still slightly too high. At load, the trend continues: our test model consumes far more than the competitors. We generated full load using Prime95 and FurMark and measured between 72 - 85.1 W on the K75DE. The provided 90 W power adapter has enough juice. The similarly-equipped Samsung notebook consumes 54.5 W in the same conditions. It is worth noting that the 355E7C suffers from CPU throttling at full load. Still, even the Sony Vaio requires a max of 62 W.
We really like the consumption while turned off. 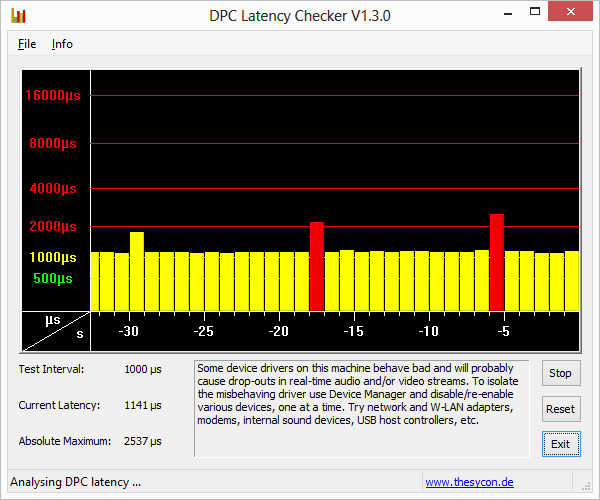 The laptop required 0.0 - 0.1 W while off and 0.3 W in standby. 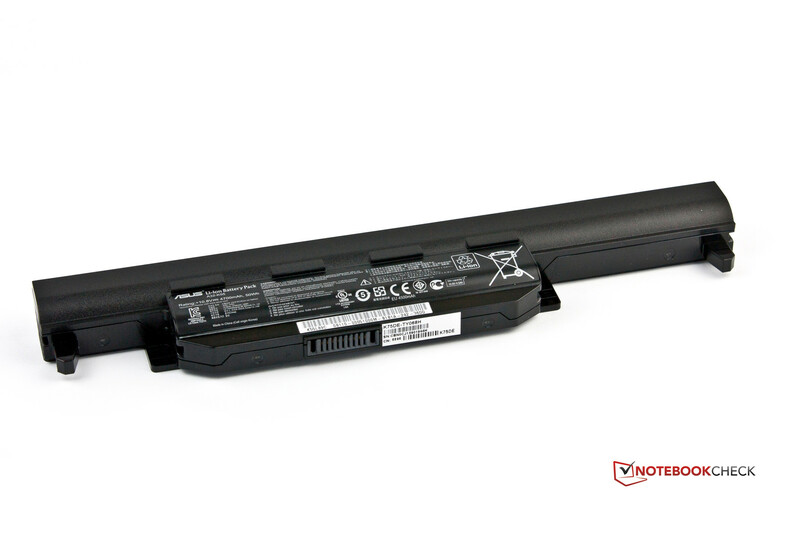 While idle, Asus K75DE trumps both the Samsung 355E7C-S05DE and the Sony Vaio SV-E1712F1EW in the Battery Eater Reader's test (minimum brightness and WLAN off). The Asus lasts a great 8:12 hours. In the WLAN surf test, the test model ran a good 4:08 hours, once again leaving the competitors behind. At load and during DVD playback, the gap decreased. The high power consumption values start playing a noticeable role. Taking into account the 50 Wh battery of the K75DE (largest amongst the models we have for comparison), the test model performs quite poorly (Samsung 48 Wh; Sony 44 Wh). The Asus K75DE-TY068H offers sufficient performance for everyday tasks and has enough left over to sate the needs of the occasional gamer. We like the many upgrade possibilities. Users, willing to invest in an SSD and another RAM module (around 100 Euros, ~$130), will tangibly increase the performance of this test model. Photographers should avoid this device as the display does not live up to their needs. 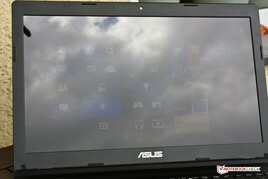 This Asus model is aimed at buyers who do not want a desktop PC and are looking for a cheap laptop with a large screen. 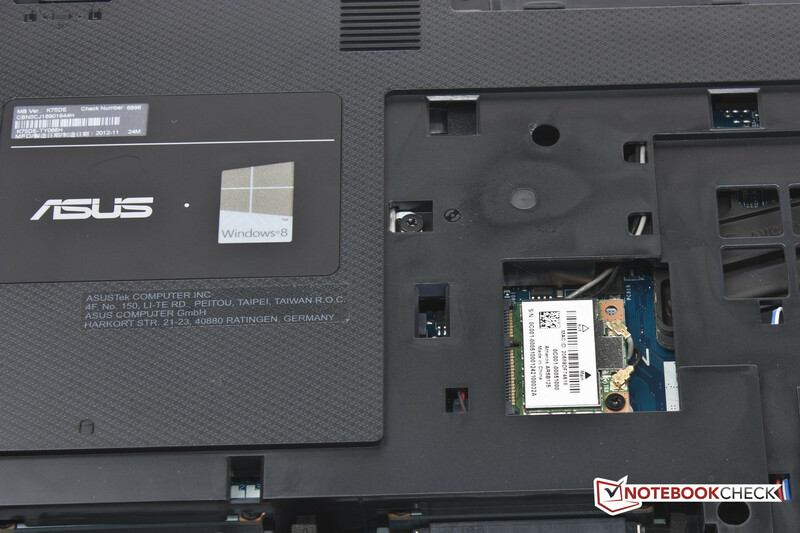 Buyers looking for a similar notebook based on Intel hardware will want to take a peek at the K75VJ. The card reader accepts SD, SDHC and SDXC cards. HDMI and two USB 3.0 ports. Two USB 2.0 ports and two 3.5 audio jacks, one for microphone and the other for headphones. The power adapter is plugged in on the right side. ... and the power adapter. Prominent: the silver power button. Keyboard without gimmicks and large touchpad. Status LEDs of the K75DE. The device is easy to maintain. The second HDD slot can accomodate another storage device. 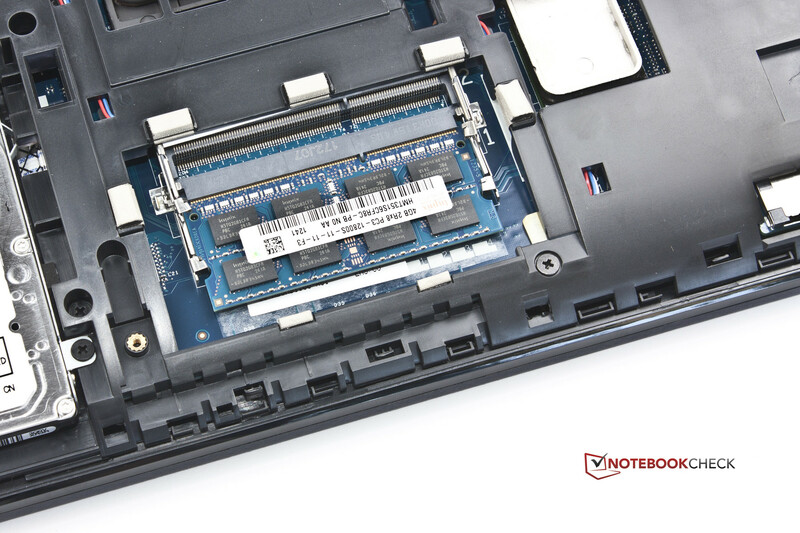 The RAM can be quickly upgraded, as one slot is already free. A lot of 3D performance for little money and the free HDD and RAM slots leave room for upgrades. The installed display could be better. 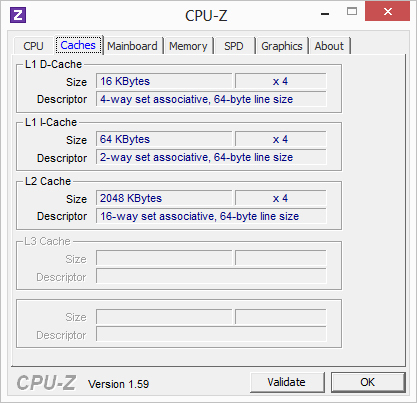 Despite the high power consumption, the K75DE achieves great runtimes. There are many competitors: for example, Samsung Series 3 355E7C-S05DE, Sony Vaio SV-E1712F1EW, HP Pavilion g7-2051sg and Asus K75VJ.